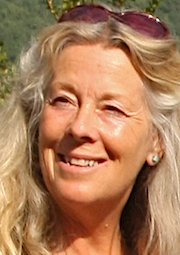 Westcountry poet, author and tutor Roselle Angwin leads the Fire in the Head creative and reflective writing programme, and a programme for the ecological imagination: The Wild Ways. She's passionate about the creative process, the environment, and the psychology of myth as living practice; and especially in how creativity can help us reconnect with and revision our relationships with each other, the land and other species, as well as with the hidden aspects of ourselves. As a poet, she has undertaken many residencies, and has been the recipient of Arts Council England support. Her poetry and prose is widely published and has won several awards and prizes. Roselle frequently collaborates with artists, musicians, dancers and sculptors, often on the land. Her poetry has been displayed on buses and cathedral websites, has appeared in numerous anthologies, been etched into glass, hung from trees, printed on T-shirts, carved into or painted onto stone, metal and wood, become pennants behind bicycles, painted, sung, composed to, choreographed, recorded, broadcast, danced, performed, and eaten by sheep. A Trick of the Light: poems from Iona is her fourth solo poetry collection.